Mercurius Basic Edition released for free within Legatum Homeopathicum project. Complete Repertory 2010 French is released for Mercurius. Complete Repertory Classics is now available as a replacement for CR 4.5. Complete Repertory 2009 is now available. Mercurius is a modern repertorization and materia medica software for homeopathic practitioners, providing you the highest quality information on which you can base your prescriptions. To date, Mercurius has users in 70 countries. Download a demo version of Mercurius homeopathic software and give it a try. Mercurius is currently available in English, Slovak and Czech. Very affordable pricing. Check out the best deal in homeopathic softwares. 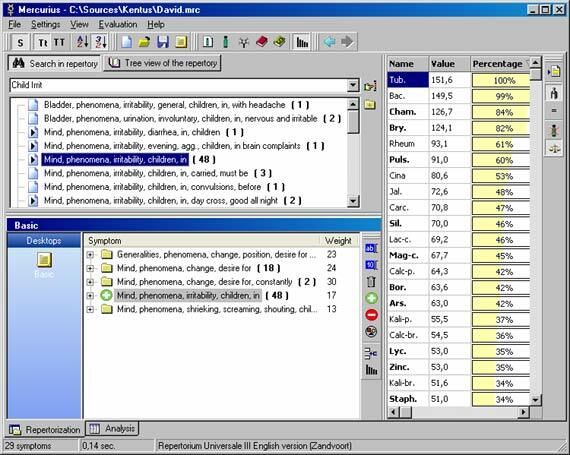 Combines repertory, materia medica and the patient management system in a single piece of homeopathic software. Is always among the first to release the latest version of the Complete Repertory. See complete list of available repertories. Features 100 000+ pages of spellchecked, corrected and unified Materia Medicae. Provides compensated repertory model for all supported repertories. Designed by people who have been working for years as computer professionals, yet also practice homeopathy - it has the best of both worlds. Built on modern technologies, combines ease of use and superior performance. Feel free to use the tree-style expandable menu on the left to quickly locate the topic of your interest. Click the + sign to expand the hierarchy. Copyright © 2004-2013 AEON GROUP spol. s r.o. All rights reserved.